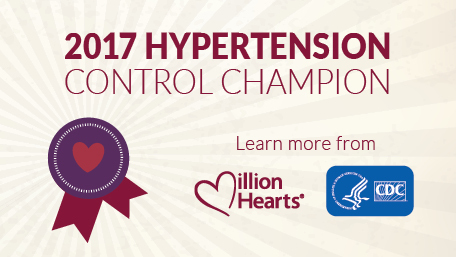 The Champions, who provide care to more than 1.2 million adults, focused on proven strategies to help their patients achieve blood pressure control at rates at or above the Million Hearts® target of 70 percent. The Million Hearts initiative began a new five-year phase called Million Hearts 2022, with a renewed focus on keeping people healthy, optimizing care, and improving outcomes for priority populations. · Making high blood pressure control a priority. · Using evidence-based treatment guidelines and protocols. · Using health care teams to increase the frequency of contact with patients. · Consistently and strategically using electronic health records that include clinical decision support tools, patient reminders, and registry functionality. · Staying engaged with patients by offering free blood pressure checks and using a patient navigator, care coordinator, and home monitoring of blood pressure. Million Hearts is a national initiative, co-led by the CDC and Centers for Medicare & Medicaid Services to prevent 1 million heart attacks and strokes between 2017 and 2022. Saving lives through better blood pressure control has been a longstanding CDC priority. CDC recognizes the Champions’ performance and shares their lessons learned to inspire others to focus on achieving similar success.